On August 4, 2013 September 24, 2013 By cherylmahoneyIn Ruminations, What Are You Reading? Regular readers know that I’m kind of a fan of L. M. Montgomery. So it may surprise you that I haven’t read her Emily of New Moon trilogy since I was sixteen! I’ve reread plenty of others, but it’s been a long time for that one. So this week I am deep into correcting that oversight. I’m almost done with the first book, and plan to go right along into Emily Climbs and Emily’s Quest. After Emily, I plan to jump to another reread and read The Thief by Megan Whalen Turner, another favorite I haven’t visited in too long. Meanwhile at the library, I’m #75 in the hold list for Neil Gaiman’s new book, The Ocean at the End of the Lane, which is not bad considering I got in line at #125, and there’s currently a hold list of 237. I’m also planning to continue my series reading, and have on hold Flame of Sevenwaters by Juliet Marillier, and The Passion of the Purple Plumeria by Lauren Willig, the next book in the Pink Carnation series, which releases on Tuesday. So much for my reading plans! Visit Book Journey for other What Are You Reading posts. And…what are you reading? Good luck with your re-reads. I am currently working my way through the weighty A Clash of Kings the second instalment in Martin’s A Song of Ice and Fire series! Whew, I imagine that would take some time. Have fun! 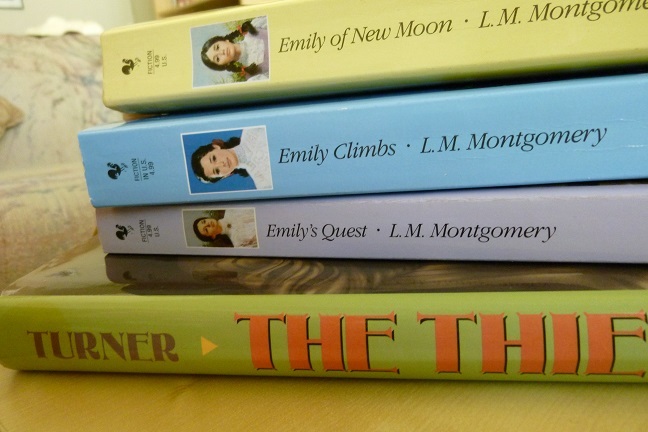 I love Montgomery’s Emily series! I reread several times throughout middle and high school, but I reread it as an adult for the first time last year. It was a lot sadder than I remembered, but I still enjoyed Emily’s flashes and writing. That’s a really interesting observation, that it was sadder than you remembered. I’m only midway through the trilogy, but I’m also finding it darker than I remembered–I think some things may have gone past me (or at least weren’t fully appreciated) when I was younger. Of the two libraries I use, one doesn’t have The Ocean At The End Of The Lane available at the moment for some reason, and the other is closed due to a fire. Guess I’ll have to wait to read it. Oh no! I’m lucky that my library system is quite big, and let’s me request books from any branch. I hope you can get Ocean some time soon! I am way down on the list for Neil’s and Lauren’s book. They will probably be fall books. Have a great week. I got lucky with the Pink Carnation book–only #4 in line, so once the library gets their copies in, I’m set. With Gaiman, I’m kicking myself for not getting in line sooner! Wow! 237 people in line for Neil Gaiman’s new book?! You are right – being #75 isn’t too bad when seen from that perspective. How long do you think it will be before it’s your turn? I’m thinking 4-6 weeks…there are about 30 copies in the system, people can keep a book up to three weeks–but it’s a short book, so hopefully people will turn it around faster than that! There is some definite darkness in Emily! I’m not sure I can recommend LMM’s journals from that angle. The first volume, definitely (and that’s where the clearest inspiration for her novels is) but while there’s lots of ups and downs, it does ultimately spiral towards increasingly tragic. I found the journals *fascinating* and I think I’ve read every volume at least twice…but there are definitely parts that aren’t nice! You might want to try a biography (“Gift of Wings” is excellent) and then decide whether to attempt the journals!